In spite of a positive start to life in Division 1 of the Cosmopolitan Soccer League, Sunday will present the Shamrocks with arguably their most important test when they face fellow promoted side Polonia (Randalls Island 75 – 4pm). The Greenpoint-based side edged the Rocks in last season’s race for the Division 2 title and for coach Kevin Grogan, Sunday’s first away game of the new season was always going to be a vital, season-defining six-pointer. Grogan will be boosted by the fact that Joe Connolly is available for selection after the forward recovered from Sunday’s nasty clash of heads. Aside from Lee Toland, all of the Shamrocks are available for what their gaffer sees as a must-win game. “It’s the biggest game of the season by a mile,” Grogan told NYShamrockSC.com. “It’s a six-pointer because they were promoted along with us. Sunday is all about work ethic, discipline, concentration levels and making sure we don’t get complacent after a few decent results. Polonia have been unlucky not to win a game yet, losing their first two by the slimmest of margins away to United FC and at home to NY Athletic Club before earning their first point of the season last Sunday at Manhattan Celtic In a scoreless draw. The Polonia Reserves have a similar record to their counterparts on the first team, coming into Sunday’s clash against Stevie Doyle’s men with a draw and two losses. Two high-scoring wins for the Rocks in which they have racked up 11 goals in two games have placed them firmly in the category of “team to watch”, something Doyle is very conscious of. “We had a couple of good battles with them last season and we expect nothing less than that on Sunday,” he admitted. St Michael’s will host games for Shamrocks 1960 and Shamrocks Legends on Sunday, both teams keenly pursuing vital victories. Shamrocks 1960 have three wins from three but AO Brooklyn are nipping at their heels and the 1pm game is already shaping up to be a six-pointer for the newly formed Metro 2 side. The Legends face a very tough test against league leaders SC Eintracht Over-30 at 11am. Eintracht have already scored 20 goals in their three wins so far and will be going into this one full of confidence. Paddy Mc Carry returns from paternity leave to guide his undefeated Over 30s league champions into their clash with unknown quantity Nieuw Amsterdam (Randalls Island 83 – 5pm). It’s tight at the top of the league after three games with Shamrocks, Central Park Rangers Old Boys and Manhattan Celtic Legends all on a 2-1 record so Mc Carry will be keen not to slip up against Nieuw Amsterdam who have played two games, losing to Celtic and drawing with NY Greek Americans. 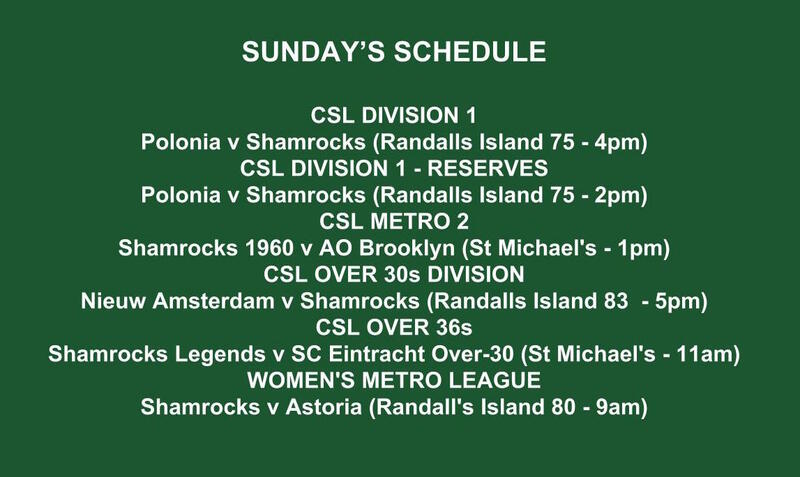 The first game of the day on Sunday will see the Shamrocks Women take on Astoria at Randall’s Island 80 at 9am as the Rocks seek out a third win on the bounce with their team strengthening as the season enters October.